Obtaining copyright permission to use digital and online content can be both straightforward and complex. 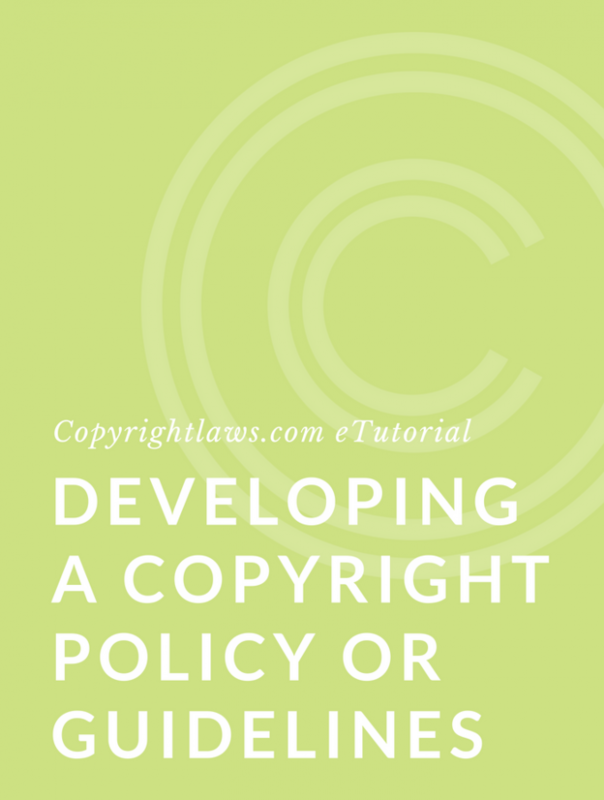 Developing best practices for legally using third-party content helps you stay copyright compliant and lowers your risk of copyright infringement. (Also see our Copyright Leadership Certificate program for these same purposes.) Below, we set out our copyright tips and strategies to help you create your own best practices. 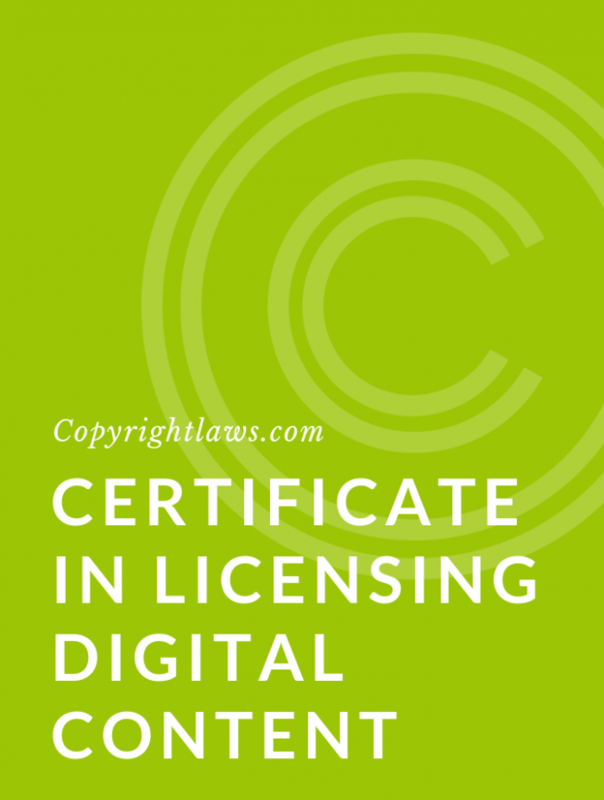 Obtaining permission to use digital content, whether online or in a physical container such as a DVD, should generally be approached in the same manner as analog or traditional content. If you first need to brush up on copyright law principles, see our copyright law primer. The questions below logically walk you through the copyright permissions process. Are you using a work that’s protected by copyright? Digital and non-digital works are equally protected by copyright. Follow the rule that content on the internet is protected by copyright unless there’s information associated with the content stating otherwise. Similarly, copyright protects digital content such as a movie on a DVD. Is the duration of copyright still running or is the work in the public domain? In the U.S., copyright protection lasts 70 years after the author’s death. In some countries such as Canada, duration is life-plus-fifty. When using work in an online forum such as a website, blog or on social media, get permission for life-plus-seventy to cover yourself in all countries. Once copyright has expired, you’re free to use the work without permission. However, see below about moral rights, which are perpetual in some countries. Is the work an adaptation or translation of a public domain work? Adaptations and translations may be copyright-protected works even if they’re based on public domain works. Generally, digitizing a work doesn’t in itself result in a new copyright-protected work. However, if it’s more than a mere digitization and there are modifications to the work, there may be a new copyright-protected work. In this situation, you may need to obtain permission from the owners of both the original underlying work and the new digital work. Are there underlying works for which you need permission? Digital works are, by their very nature, comprised of many layers of rights and different kinds of copyright-protected works. The following often consist of various types of works, from literary (including computer software/code) to artistic to musical to audiovisual. You must clear each of these works when creating a multimedia work or reproducing a part of that work. Different works may have different copyright durations and different ownership and authorship. You need to get permission for each of the underlying works as well as the “final” work you are reproducing. Are you using a substantial portion of a work? Generally, very small uses of works such as quotes don’t require permission. There’s no actual defined amount that wouldn’t require permission as it depends on the facts of each particular circumstance. Of course, it’s more difficult to use a “small” portion of a photograph or painting. Are you using the work in a copyright sense? Reproducing, publishing, performing in public, or adapting a work are copyright uses. Also, including content on a DVD, blog, digital archive or library are copyright uses. Is there an exception in the law that exempts you from obtaining permission? Exceptions are free uses set out in copyright acts for limited uses and/or limited audiences. For example, some copyright acts have exceptions or special provisions for libraries, archives and museums. Some also have exceptions for educational institutions. Exceptions in copyright acts vary from country to country. Check your country’s copyright statute to see what exceptions exist that may apply to your exact use of content. Fair use or fair dealing may apply to your situation as well. Fair use and fair dealing require a judgment call. Ultimately, only a judge in a court of law can make this determination. Most who apply fair use or fair dealing approach these provisions as risk analysis situations. Are you using the work in a country where an author has moral rights? If so, are you modifying the work in a manner that may be prejudicial to the honor or reputation of the author? And does the author’s name appear in association with the work? In the U.S., moral rights only attach to authors of works of fine art. However, in many countries, authors of all copyright-protected works have moral rights. Even mere digitization of a work may arguably result in a modification of that work and may harm an author’s reputation. Thus, moral rights may have an even greater role in the digital world. If possible, obtain a waiver of moral rights if you’re using the work on a global basis. Social media uses are generally global uses. Not all countries allow for a waiver of moral rights. Do you already have permission to use the work? Check your database of permissions to see whether you’ve already obtained permission to use the work in question in the manner in which you wish to use it. Make sure that a previous permission covers your current use. You may have direct permission to use the work from its owner, through a copyright collective agreement or through a digital license with a database publisher or content aggregator. If a fellow employee created the work, your employer/organization may be its owner; therefore you don’t need to seek permission to use it. Also, you may have implied permission to use the work by virtue of its nature and availability — this is a copyright risk analysis you need to make. Further, the work in question may be covered by a Creative Commons (CC) license. Again, check to determine what uses this CC license permits, and follow those terms and conditions when you use the work. 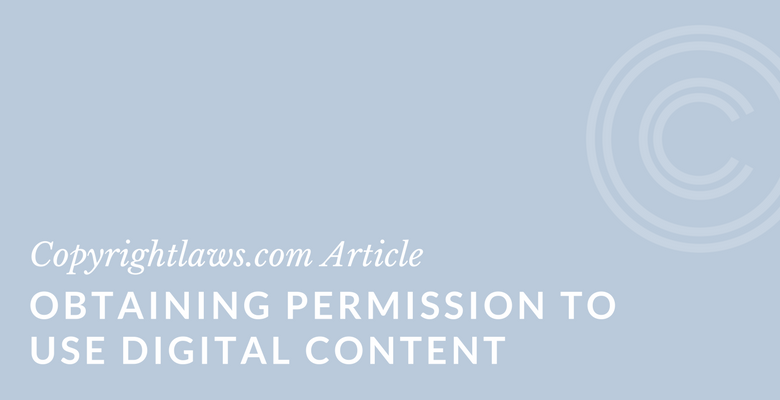 If you’re obtaining permission to use content in a digital format, also consider obtaining some traditional rights. For example, you may want to promote some of the content through print publications and may require certain print rights. Your permission to use the content on a website, for example, may not include the right to digitally archive that same content on a DVD or on the internet. Consider all digital rights you may need during your initial negotiations with the rights holder. It’s always better to obtain more rights than what you need (if you can afford to do so) than to have to later negotiate further rights for use or re-use of the same works. The value of digital content is a matter of negotiation. Sometimes rights holders see their work as having more value in the future in a digital format. They may ask for much more than you’re willing to pay for that content. Determine your budget and place your own value on those works before negotiating with the rights holder. The internet often means that content may be reproduced in unlimited quantities. Is the rights holder in agreement with this? Digital content may be reproduced in a variety of qualities. Negotiate the quality of the reproduction with the rights holder to avoid a future complaint by them and possible allegation of moral rights infringement (right of integrity). If you’re adapting the content at all or digitizing traditional content, ensure the rights holder is fully aware of your use of the content and agrees with what you’re doing with it. Consider how you’ll pay the rights holder. If the rights holder is a book author, for example, they’re used to being paid a royalty for the use of their work. However, in the digital world, it often makes more sense to pay a fixed fee, especially if a work is one of thousands going into a DVD or onto a social networking site. This is negotiable. Many rights holders are concerned about unauthorized uses of their works once they’re available in a digital format. What precautions are you taking to protect content? Examples include copyright notices, encryption, password protected sites and policing authorized uses. Whether you’re clearing copyright in traditional or digital content, a checklist, written permissions policy or best practices document may help ensure your organization has a thorough and consistent approach to clearing digital permissions. This may be a standalone document or part of an intellectual property or copyright policy. Life is complicated. Copyright law shouldn’t be. Copyrightlaws.com’s Copyright Leadership Certificate (a 12-week online program) teaches you how to lower your copyright risks and avoid expensive and time consuming legal hassles.